Seriously, is there anyone more awesome than Chris Pratt? He’s hilarious, he’s a total hunk, and best of all, he has a huge heart. Chris just proved once again that he will do anything for his fans. Get ready for some feels, because this story is going to make you feel all of them: When Chris Pratt found out a young fan was dying, he challenged Death to a chess match for the kid’s life. OMG! This is why we love you, Chris Pratt! After hearing that 10-year-old Guardians Of The Galaxy fan Jabari Cole had terminal cancer, Chris Pratt immediately journeyed to a stark rocky shore, where he found Death himself waiting by an ash-blackened chessboard. Next to the hooded Reaper, in a hospital bed, lay 10-year-old Jabari, who looked on as Death silently nodded, Chris Pratt took his seat, and the chess match for Jabari’s life began. And we didn’t think this guy could even get any cooler! Chris began the match with a bold Queen’s Gambit. As he took one of Death’s pawns, color suddenly began to return to Jabari’s cheeks. But when Death, in his infinite shrewdness, battled back to win one of Chris Pratt’s pieces, Jabari’s breathing became labored. The Reaper then pressed his advantage and began to threaten Chris’s king, causing Jabari to get sicker and sicker. But, um, do we even need to remind you that Chris Pratt is the greatest? He dug deep and managed to capture Death’s bishop, causing Jabari’s hair to grow an inch as his coughing ceased and he summoned the strength to reach up a hand and give the thumbs-up. And you better believe Jabari was smiling from ear to ear when he noticed Chris was dressed like his favorite character, Star-Lord. Three words: Best. Celeb. Ever. As the match went on, the sun and moon rose simultaneously on both sides of the rocky outcropping where Chris and the Spectre of Death sat. Chris surrendered a knight, and Death gave up a rook as Jabari grew by turns stronger and weaker. 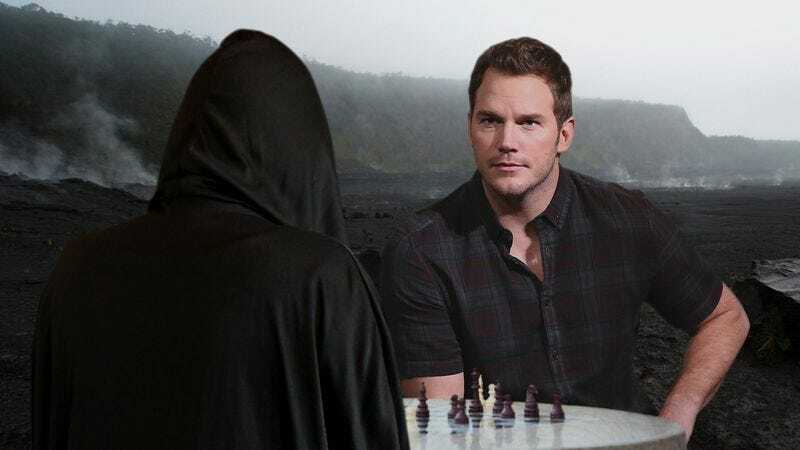 At one point, Death taunted his opponent by saying, “Passengers was a critical flop, Chris.” But instead of getting flustered, Chris Pratt kept his focus on the board and took another pawn, flexing his bicep and winking at his young fan. Chris, can we be best friends???? A sooty raven has now landed next to the pair, its guttural cry shaking Jabari’s weak frame. Chris has a few key pieces left on the board, with Death’s cold and final shadow looming over it all. Will Chris Pratt win out and save his fan’s life, or will the implacable Reaper own the day? Only time will tell, but we definitely know who we’re rooting for. You can do it, Chris! You are beyond adorable.